The White-headed vulture (Trigonoceps occipitalis Burchell, 1824) is without any doubt one of the vultures having the most coloured and elegant livery in the Old World. Easily distinguishable on the field from any other membre of this group, it can be only mistaken prima facie with the palm-nut vulture (Gypohierax angolensis) due to the white-black colour it shows when still as well as when flying but immediately recognizable due to the different size, the absolutely different morphological features and also due to the diversity of the frequented areal. The white-headed vulture belongs to the order of the Accipitriformes, to the family of the Accipitridae and is the only species assigned to the genus Trigonoceps. Also in this case its has been discussed for long time about the proper allocation of this raptor in a new genus instead of placing in one of the others already present in the African continent and perhaps in the future with the more detailed research fruit of the modern genetic technologies, it will be possible to reach a new reclassification of this group of birds. Linked to the African continent, it is not very common, even if the territory covered is considerably vast. Although being a frequenter of savannahs, it is more easily met along the main communication routes while monitoring from top possible victims accidentally killed by passing-by vehicles. With the Hooded vulture (Necrosyrtes monachus) it shares the characteristic of being able to start flying early in the morning when the air temperature is still low and hinders the fight of the large vultures, for which reason it is able to be among the first discovering the carcasses of the nocturnal predations and to nourish anticipating the arrival of the most greedy and more aggressive cousins. All the common names given to this raptor reflect fully its peculiar morphological characteristics in particular with reference to the colour of the head. In French Vautour à tête blanche; in German Wollkopfgeier; in Spanish Buitre cabeciblanco; in Dutch Witkopgier and in Italian Avvoltoio testabianca. The etymology of the scientific name is also referred to this characteristic, Trigonoceps from the Greek “trion” = three and “gonia” = angle, hence triangle and “ceps” = head. Clear reference to the triangular shape of the head when seen from far away, emphasized by the white down covering the same on the rear part like a crest. Occipitalis , from the Latin, to rightly indicate the back side of the head where this down is located. 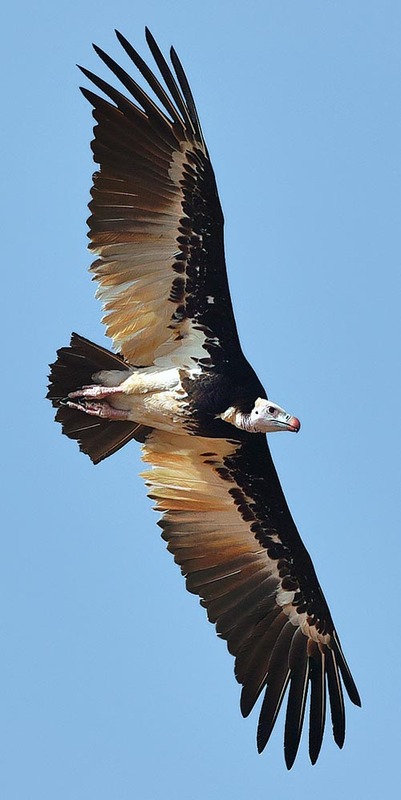 The white-headed vulture lives uniquely in the African continent but with a considerable territorial discontinuity. It occupies the sub-Saharan area, more frequent and more assiduous in the belt going from Senegal to Ethiopia and maintains a certain continuity only in the east of the continent reaching Mozambique and again westward up to Namibia and Angola leaving practically uninhabited the central part of Africa. Its geographic presence is however in discontinuous and isolated spots. Although having such a vast areal, this bird is never common and is usually met isolated or in groups composed by very few individuals. This behaviour is maintained during the reconnaissance flight as well as during the feeding. The overall population therefore does not reach levels such to be considered as a common bird. 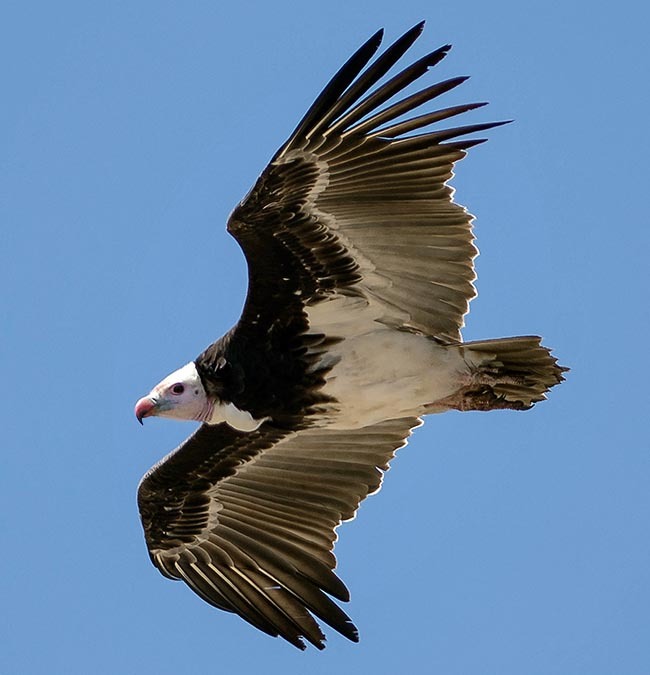 The white-headed vulture spends most of the day flying, usually at particularly high altitude and comes down to earth only when it has discovered a carcass or to perch for the night. It loves sparse forests and savannahs with a good presence of big acacias , with a strong preference for the baobabs but avoiding pre-desert and without vegetation zones. It systematically avoids direct contacts with the man and the inhabited centres even if it frequents, during the reconnaissance flights roads and communication routes looking for possible animals injured or killed by the road trafic. It does not love to live in high altitude locations even if in the Ethiopian highlands it can be easily met at more than 3000 m of altitude. It is a sedentary bird even if it shows some short range juvenile errations typical to the vultures. 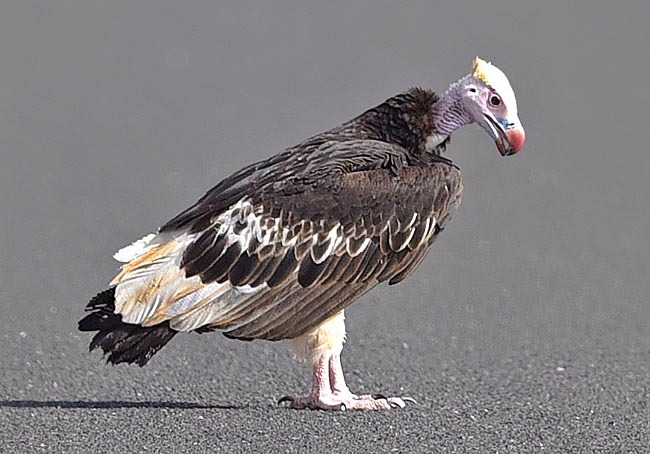 The white-headed vulture is practically silent, like all its similars, but emits strong hisses during the competition for the food when close to the carcasses. Among the vultures it is the one who perhaps integrates more its diet with lizards, insects, small animals and snakes. It is thought that it may attack also small mammals. Among the Africa vultures the white-headed is considered as a medium sized raptor, intermediate between the big specimens of the genus Gyps (Gyps africanus, Gyps fulvus, Gyps rueppellii) and Torgos (Torgos tracheliotus) and the small Necrosyrtes monachus e Neophron percnopterus. The dimensions are however considerable having a wingspan exceeding amply the 2 m, a weight that may reach the 5 kg and a total length of 100 cm. As already mentioned, the livery of this vulture is particularly elegant and groups rather particular colours and combinations. The beak, able to tear easily the carcasses, is very big, very robust and hooked and is of lively orange red colour, surrounded by a light bluish cere and a pinkish face and occupies preponderantly the head, as if it were disproportioned for this animal. The head and the neck are bare and covered by a slight white down forming, on the back, a prominent crest that visibly causes a cranial deformation that is finally distinctive cause of its name. The upper coverts are totally jet-black, with the contrasting remiges of a snowy white colour. The chest in the upper part is totally black whilst in the lower part is of an absolute whiteness. When flying it shows a totally black belt in correspondence to the lower coverts and of the primary remiges whilst the secondary ones are completely white in the female and black in the male. The tail is black. Practically, a white and black bird wit a big multi-coloured head. The livery of the immatures is totally lacking of the white. The nidification takes place in every season in the tropical part of its areal even if in other areas it prefers to spawn in the dry season matching up the presence of the nestlings during the more profitable rain season. It does not nidify all the years seen the long period necessary for completing successfully the reproductive cycle. It usually builds the nest on big trees inaccessible to the terrestrial predators, placing it in a well high position dominating the surroun- ding area. 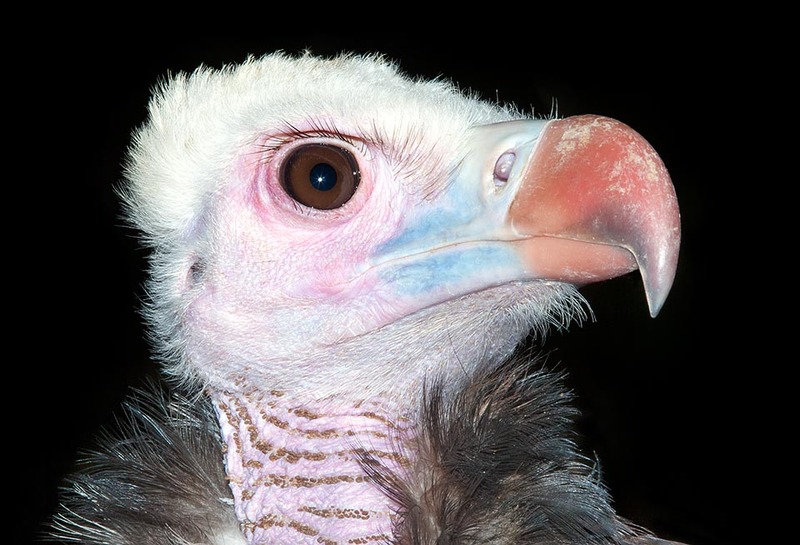 Like most of the vultures, it lays only one whitish egg that is hatched for about two months. The chick remains in the nest for 4 months more getting the total independence from the parents after 3-4 months from the first flight. An overall duration close to the year. 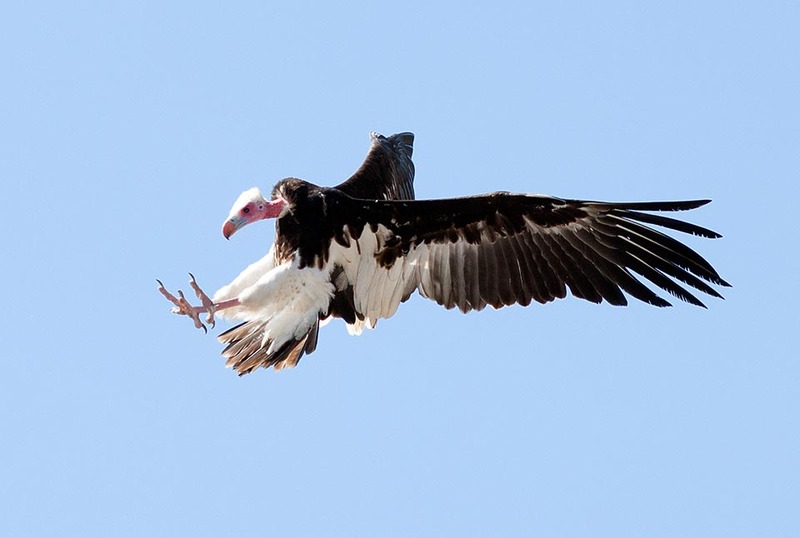 Like many African vultures, the overall population of this raptor is in continuous decrease. Subject in tome areas to illegal taking due to the use of some of its parts in the local medicine and for fetishistic use, is moreover involuntary victim of poisonings caused by baits scattered for other purposes. It is nowadays a bird confined in protected areas in the natural parks, seen the revulsion towards the urbanized areas and their number is strictly linked to the protection guaranteed by these particular ambients. It is considered as a vulnerable species and indicated in the CITES II. Lophogyps occipitalis Burchell 1824; Vultur occipitalis Heuglin, 1855.